"Share multimedia files with other digital devices and use the augmented reality application to connect to a world of information. A voice-to-text feature allows communication without the need to type." 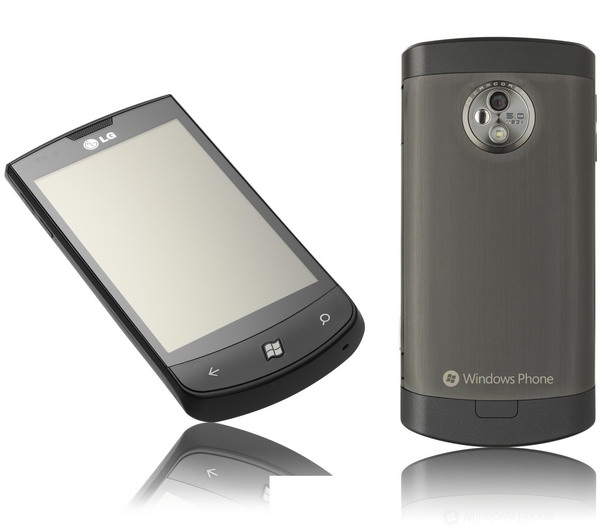 The LG Optimus has a lot in common with the LG Quantum, minus the keyboard - it also has a slightly bigger screen. I like the overall design and the two-tone back. 16 GB of storage is nice to see, and it's quite thin at 11.5mm. If the DLNA media sharing works properly, that would be a nice feature! "If the DLNA media sharing works properly"
It does - at least in my pretty thorough tests with streaming to WMP in Win7. You've tested this specific device already? Yes, last week, a production model with final WP7. Pretty nice (particularly the three add-on apps not originally present in WP7), albeit the lack of front-side camera is annoying. And, of course, in panorama mode the vertical resolution leaves a lot to be desired. Yes, last week. Pretty nice (particularly the three add-on apps), albeit the lack of front-side camera is annoying. Awesome! Have you written up a review/impressions anywhere? I'd love to link to that! Can't really - reviews or even more thorough specs (e.g., RAM size) are under NDA until 21/10. Well I'm glad SOMEONE is under an HTC NDA, because it's sure not me. What site are you writing for now? It's LG's NDA, not that of HTC Albeit other manufacturers surely have their own NDA so that the other manufacturers' don't quickly put more RAM, a faster CPU etc. in their models in the last minute to come put with a better model than the competition. Last edited by Menneisyys; 10-11-2010 at 10:42 PM.. It's LG's NDA, not that of HTC...Hal's PPCMag. Ah, right, whoops! Drop me a line when you publish it. BTW, WP7 is REALLY much better than WM6.5 and far-far more intuitive when actually used. I'd say it's about on par with iOS when it comes to intuitiveness. Of course, it has some disadvantages; for example, the lack of copy/paste and the missing landscape keyboard / orientation support in some apps. But it has advantages over iOS too; for example, the entire dynamic(!) tiling, showing the actual avatars of your contacts, is far-far better. I really hope third-party programming takes off - the promised game list is pretty promising.